The essential cinnamon roll recipe that everyone needs to have tucked away in their bag of tricks. 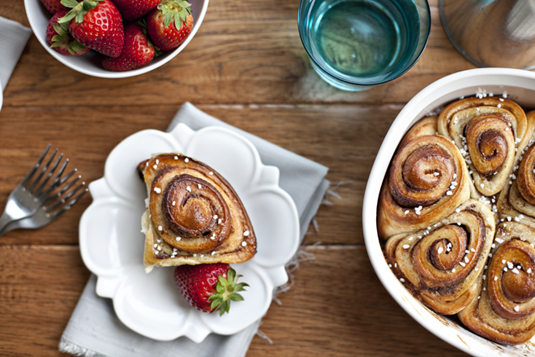 This one is Swedish in origin, a kanelbulle or “cinnamon bun,” and rest assured there is plenty of cardamom in the dough for a spicy kick. It’s that same trait that led to the production of 80 cinnamon rolls last week as I tried recipes and tweaked and twisted and finally landed on the cinnamon buns I was looking for, the ones that need no glaze, but instead, sing on their own. I found them in a cardamom-spiced dough traditional to their origin. They are a bit lighter than their American counterparts, and they puff up easily, showing off the swirl of cinnamon tucked within. The first order of business is scalding the milk. Simply heat the milk in a saucepan over medium heat until bubbles form around the edge of the pan and the temperature reaches 180° F. Turn the burner off and add in butter, sugar, cardamom and salt. I like to toss in unmelted butter here as it melts and cools the milk simultaneously, meaning I don’t need to wait for the milk to cool for as long. When the milk mixture is down to between 110° and 120° F, sprinkle the yeast over the top and wait 10 minutes for the yeast to froth. Dump the milk mixture into your stand mixer or a large bowl and slowly add in four cups of flour. Change to the dough hook Allow the mixer to run on high for 30 seconds or so after you add the last cup so that it pulls the dough together and away from the sides of the bowl. If you’re hand mixing, you can just knead the dough lightly in the bowl. Cover it up and let it rise in a warm place for an hour. 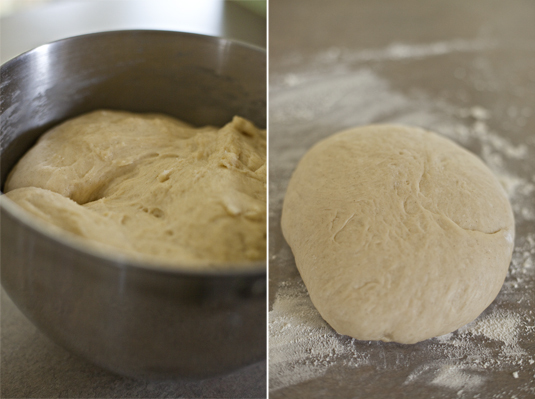 Once the dough has risen, punch it down, turn it onto a lightly floured surface and knead it gently into a ball. Roll the dough into a rectangle. I like to go with the larger the rectangle, the more cinnamon swirl, and I’m all for several rolls of cinnamon in my cinnamon buns. Brush melted butter onto the dough. Then sprinkle sugar and cinnamon all over the top. Again, there is some leniency here as far as amounts are concerned. You could go heavier on both the cinnamon and the sugar, the cinnamon only, whatever suits your taste preferences. Roll up your rectangle starting at one end and moving down towards the other and then reversing and coming back until you have a long cylinder of dough. 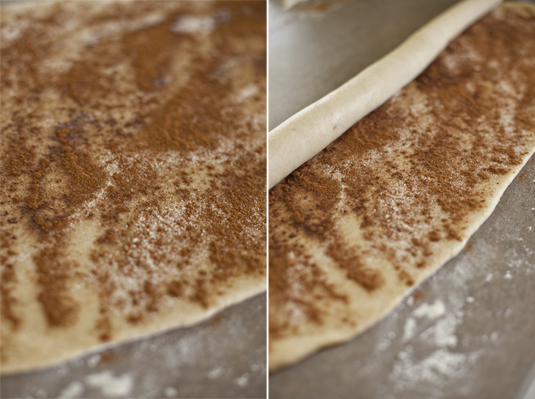 It’s a pretty forgiving dough, so don’t be afraid to stretch and pull on it. Cut rolls off the tube. I aim for about an 1-1/2″-2″ thick. Much thicker and cooking time and temperature will need to be adjusted. Place the rolls in the vessel you intend to bake them in or on. These can be set on baking sheets, placed in baking dishes or however you prefer. Be sure to leave room because after the next 45-minute rest, the cinnamon rolls will puff up quite nicely. Before baking, brush them with a bit of egg wash and sprinkle with pearl sugar. You can skip the sugar sprinkle if you plan on glazing them at the end. 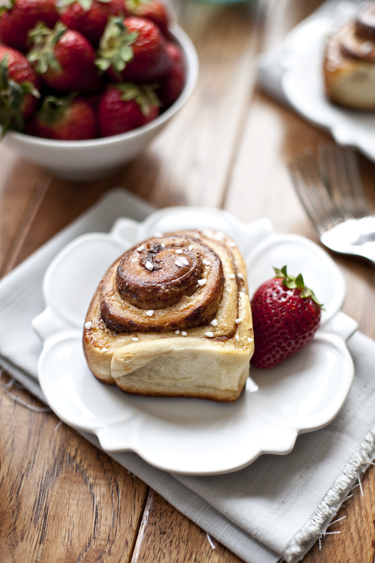 A short bake time in the oven, and piping hot cinnamon buns will be on your table. These are perfect for a brunch, an Easter breakfast, a lazy Saturday morning or any other day of the week. Make the cinnamon rolls the night before and once they are on their baking sheet or in a baking dish, cover and store them in the refrigerator. Shower. Dress. Start your coffee. Then come back to your proofing rolls. Toss them in the oven and bake as directed. 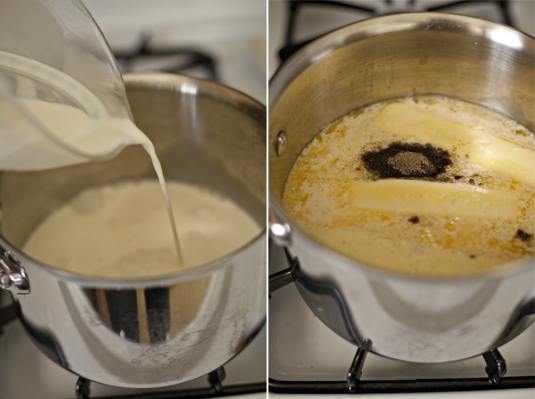 In a medium saucepan, heat milk over medium heat until small bubbles form around the edges and the milk reaches 180° F. Turn the burner off and add in the 1-1/2 sticks of butter, half cup of sugar, cardamom and salt. Stir to combine and continue stirring until the butter is completely melted. 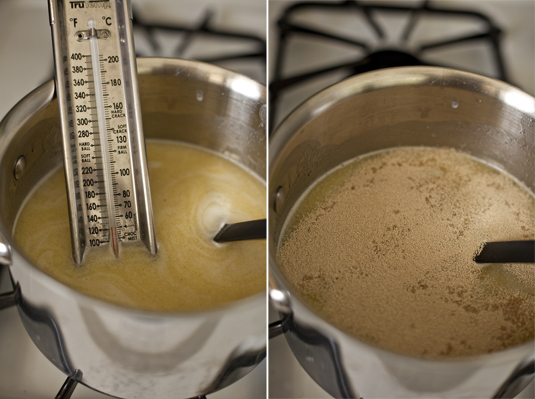 The mixture should be between 110° F and 120° F at this point. If the temperature is higher, wait for it to drop slightly before proceeding. Sprinkle yeast over the milk mixture and let it sit for 10 minutes. When the yeast is frothy, mix it in and move to a stand mixer or large bowl. Using a spoon or paddle attachment at first and then a dough hook, slowly mix in the flour 1/2 cup at a time, stirring to completely incorporate after each addition until all four cups of flour are mixed in and the dough is smooth. Cover the bowl and let the dough rise in a warm spot for one full hour. When the dough has risen, punch it down and knead lightly. 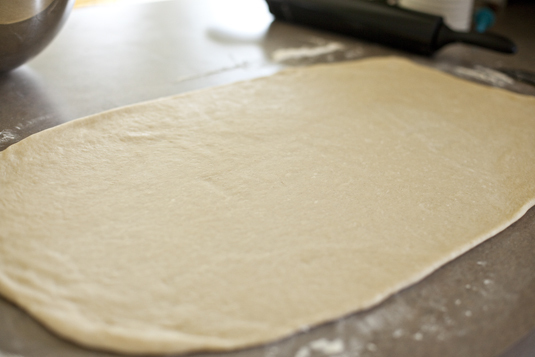 On a lightly floured surface, roll the dough into a large rectangle. 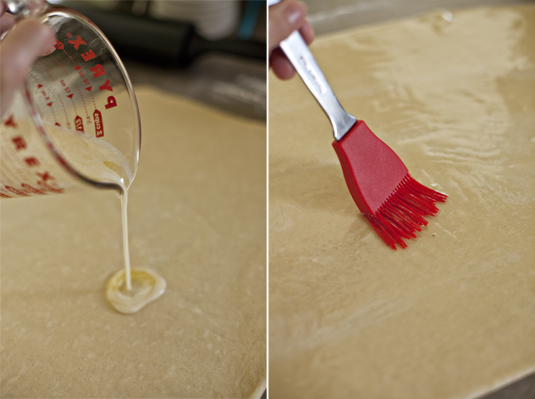 Spread half the melted butter for the filling on the dough using a pastry brush to brush to the edges. Sprinkle the top with remaining sugar and then cinnamon (you can use extra cinnamon if you desire). 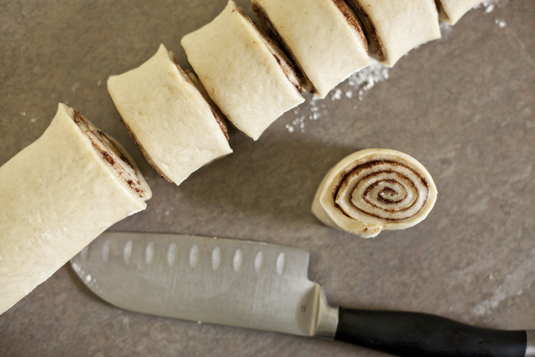 Roll the dough lengthwise into a long tube and then cut off 1-1/2″ sections/rolls. Place each roll in a greased baking pan or on a lined baking sheet at least 3 inches apart. **If you desire, you can refrigerate the rolls at this point and take them out for their second rise 1-2 hours before baking. ** Cover rolls and allow them to rise in a warm place for 45 minutes to an hour until they are puffed up. They will continue to rise in the oven, so be sure to allow room for that.. When the rolls have risen, preheat the oven to 425° F. Beat together the egg and water and brush over the tops of the rolls. Sprinkle with pearl sugar. Bake for 8-12 minutes until the tops start to turn golden brown. Remove from oven and glaze, if desired, and then allow to cool slightly. Serve warm. I’ve been reading over here for a while now, but after I read today I realized I had to comment for the first time. I too am a firstborn, perfectionist, mother of 4 who is often crazy over the ammount of stuff and mess that raising 4 little people involves, who also happens to have finally nailed down our family’s favorite cinnamon roll recipe after much trial and error just yesterday! I thought that was a crazy number of similarities we share! So crazy! Those are quite a lot of similarities. Thank you so much for taking them time to share. I’m the firstborn of five, too, so I get ya. You made me remember that I once said my house would always be clean. Six children later, I’m laughing hysterically. These rolls are beautiful. I love the addition of the pearl sugar! I still have moments, and other days I’m better about it. Someday, I tell myself, my house will be clean and only I will be making the mess. Wow, they look SO perfect! I can never get my swirl to look that nice. I also love the pearl sugar on top, I’ve got a container-ful in my cupboard I rarely use. Man, Shaina…these are picture perfect! Great how-to! Oh Shaina, these are just GORGEOUS!! I am seriously impressed. I am an oldest child also. And a perfectionist also. I feel your pain. I so wish I could have a few of these…I would have gladly taken a few dozen of your mistakes off your hands!! It’s nearly bedtime. I’m stuffed full of dinner and popcorn from the movies. 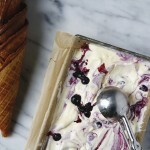 And still these photos made my mouth water. You’re no good for my diet, woman. Nor do I think 80 cinnamon rolls was probably good for yours. These are absolutely perfect! Two of these, cup of coffee and what a way to start the day! OMG-I’m loving this cardamom spiced dough! What a great idea. And I like that it has no glaze. Shaina, I would love to be your houseguest – the are perfect. And cardamom? A favorite. Have you tried that fresh cinnamon I gave you yet? How do you like it? Shaina, I would love to be your house guest – these are perfect. And cardamom? A favorite. Have you tried that fresh cinnamon I gave you yet? How do you like it? I did experiment with it! I have a recipe to share, too! Thank you again. These look soooo beautiful, Shaina! Thanks so much for the tutorial. Oooh, I love the cardamom in here. One of my favorite spices!! Very nice!!!! Great job. Being a Swede i am adding a little more history here 🙂 Hope you don’t mind. We usually eat these during Fika. We call afternoon coffee breaks “fika.” Also the big difference between Swedish bunch and American buns sweetness, American buns are a lot sweeter. In Sweden as you described we use cardamon and the buns are also baked in a very hot oven for just a few minutes. This makes them light and fluffy, with a nice brown surface yet not dry or over baked. They are always baked in individual paper cups not muffin cups but bun cups that are slightly lower. And last but not least there is no frosting or glaze. Instead on Swedish “bullar” you use pearl sugar,which you have incorporated. For those living close to Ikea that is where you can get them. These were actually my favorite for numerous reasons, but I am a fan of spicing them and not having the sickly sweet glaze over the top. Thanks for the extra history! Oh I am in trouble now. The boys are cookoo for cinnamon rolls. It’s a good thing I am playing around in the wee hours of the morning or they would be pestering me like crazy to make these immediately. I’ll surprise them one morning instead 🙂 Your photos are amazing! 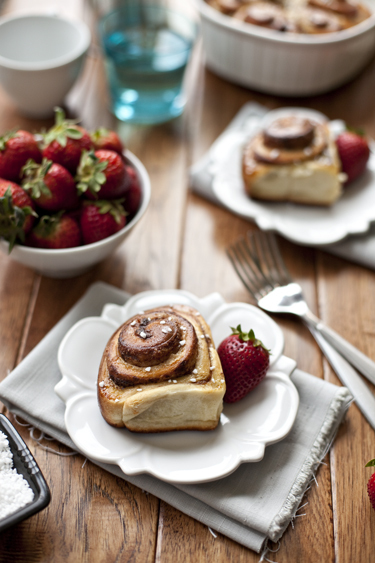 These look incredible… I am a huge fan of cinnamon rolls, and I’m always happy to discover new recipes! 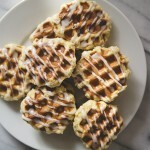 Those are so lovely — The swirls bake up beautifully. I haven’t heard of pearl sugar before … where do you normally buy it? I love the idea of letting the butter cool the milk. That had never occurred to me and I think it is brilliant. 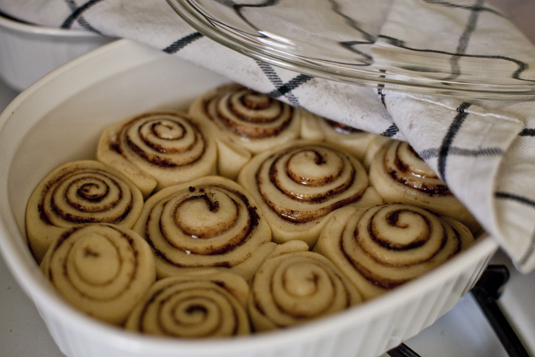 I was about to get up and make cinnamon rolls, wasting time playing on StumbleUpon,and up popped your beautiful rolls. I’m feeling much more inspired now. Lovely post! 1. When I made the rolls and let them sit for an hour in a very warm place, they did not puff up much. I blamed it on bad yeast. But, when I put them in my oven, they got HUGE. Unfortunately, I did not have enough space for them to grow. 2. The amount of sugar and butter for brushing turned out not to be enough for me. Next time, I will make sure to put a more generous amount of these ingredients. 3. I did not grease my glass bakeware because I thought that the buttery dough will not stick. However, I was totally wrong. The buns got stuck, and it was hard to take them out. So almost all of them were torn to some degree when I tried taking them out. Okay, I made lots of mistakes but again, the dough itself turned out very delicious. Highly recommend! 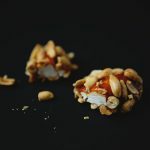 I just discovered your blog today and am loving it! I recently made Swedish cinnamon rolls and thought they were okay. Something was a little off. They didn’t turn out as fluffy as I wanted it to. I’ll have to try your recipe out! 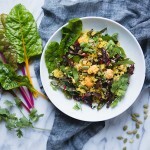 Love your blog and will be following for other great recipes and ideas (enjoyed your “going green: section). These are sublime! But I’m sitting here wondering what happened to my oldest child…my daughter. I’m an oldest, type A, reformed perfectionist I like to call myself, though there are times things really can get to me. I’ve had to learn to be “laid” back as hubby as a very messy bent. Rather I should say…doesn’t pick up after himself. Back to my daughter….why on earth did she take after her father? She’s first born. Ahhh….. 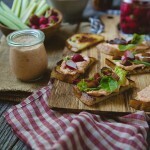 Fantastic recipe, lovely color & shape ! The rolls are looking gorgeous. Thanks for the share. These look truly delicious! I have never tried homemade cinnamon buns but you are inspiring me! 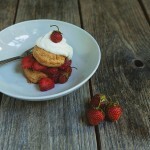 Can I use rapid rise yeast for this recipe? Do I use the same amount? Thank you.